Hello everyone, welcome. Today I am writing about my recent attendance at the UK Games Expo at the NEC and Hilton Metropole in Birmingham. This post will be a generic overview of my experience with a lot of photographs, and should be taken as a snapshot of what the Expo is like. For some of the events, activities and games on display, I will be producing more detailed articles in the days and weeks to come. I obviously can’t do this for everyone and make no apology for having favourites. With that all in mind, let’s get on with it! The primary reason for attending a Games Expo is to find out about, and perhaps even try/buy new games. As part of the press detachment I was permitted into the show preview the night before the general public, and then I spent a fair amount of time over the three day event walking around stalls, taking pictures and speaking to developers. Big Trouble in Little China – A Cooperative Sandbox game where players complete quests around the map in order to level up prior to storming Lopan’s lair. Elite Battlecards – this was a prototype of the game, where players control their own fleets and play various missions very much in keeping with the themes of Elite. Gloom of Kilforth is a quest card game that plays coop, competitively or solo produced by www.hallornothingproductions.co.uk as a sort of replacement for fantasy rpg for those who don’t have time for them. The flyer I picked up says 45 minute per player. At time of writing, this was successfully funded on Kickstarter and delivery is expected over the summer. Also from Hallornothingproductions.co.uk was 1066, Tears to Many Mothers. I have to confess I did a history nerd fanboy moment with the developer, Tristan Hall, recounting my knowledge of the Battle of Hastings. The game was described as similar play style to Magic the Gathering or any other CCG/LCG but there are no cards to collect. The game is one or two players, focuses on the historic elements of the Battle of Hastings (I reckon I’d lose my voice yelling”SHIELD…WALL!” every time I played) and can be played in under an hour. Shortly after fanboying over 1066, I had another fanboy moment when I found the Solomon Kane game by Mythic Games. In fact, it deserves a close up. Coming to Kickstarter on June 12, a cooperative narrative driven game where players take the roles of Cardinal Virtues guiding Solomon Kane through the various short stories released by Robert Howard, as well as (depending on KS success) originally produced material exploring “What if Solomon Kane was/did/visited BLANK?” The Game consists of Acts and Chapters, which are set up from card decks in a similar fashion to Time Stories – though Mythic Games were quick to point out that in this case, there is no one solution and whilst the story revelation is similar you can have multiple branching endings. Repel Boarders is a coop SciFi game where players take the roles of crew onboard a spacecraft under attack by pirates. Repel Boarders is currently on Kickstarter with just over three weeks to go. Miremarsh is a competitive game where players take the roles of Bog Goblins, each seeking to become the Goblin King of Miremarsh by completing an evil quest. I also wondered how David Bowie became goblin king. Now I know. And knowing is half the battle. The main game mechanic seems to be matching symbols from your goblin’s dice, a dice pool which can be augmented by gathering gear. Fail a dice roll, and you die and start a new character. Summoner’s Isle looks like a fun area control and energy management game with, from the description given by developer Robbie Munn, minimal downtime. Can be played 2 players or up to 4. The Old Hellfire Club is a boasting/push your luck telling tall tales game where players take the roles of Gentlemen of the now defunct secret society, the Hellfire Club. Players take it in turns to tell their boastful tales in the vain hopes of winning the patronage of the various patrons of the gin shop in order that they can buy more gin. I will be releasing a full article about this game shortly as I attended a demo and was supplied a press copy for review also, so keep your eyes peeled. Tales of the Northlands is a game based on the older cartoon, Noggin the Nog. It is a worker placement/resource management game where players take the role of Lords trying to keep Noggin on the throne, whilst Nogbad the Bad is trying to usurp him. I was able to attend a play test on this too, and have to say it was one of the most fun games I have played in a while prompting me to back it on Kickstarter. That being said, the Kickstarter is shortly finishing so if you want to grab a copy, you’ll need to get your nogs moving. I will be writing this up in more detail shortly. As pitched to me, Legends Untold is meant to give the immersion of an RPG with the speed of a card game. The game itself played pretty well (I was able to play it Sunday), with players taking characters and adding abilities to them. The setup was pretty quick and flowed quite well. This funded on Kickstarter a couple of years back and the lads developing conceded they were a bit behind schedule but hoping to be on top of things soon. I should say, the game is simply cards. In the image above, the lads at the stall had simply been geeking out with their minis and terrain. Red Alert is a Sci Fi fleet game that is the mechanical successor to Memoir 44 (a card driven wargame). Red Alert uses similar mechanics, is intended to be simple rules and plays in about 60 to 90 minutes. It goes to kickstarter on the 6th of June and the core set should have around 92 space ship miniatures. Phew, I feel tired just writing about all the cool things I found and shared. At the expo there are also scheduled games that you can participate in, I took the opportunity to learn the game Wraith as it is set in my favoured game setting but I have never played it. In a scheduled game, a Games Master runs things and a group of people join the table. In this case it was a prebooked event and I wanted to join this game as it was the only World of Darkness game running and I wanted to meet Matthew Dawkins (AKA the Gentleman Gamer, pictured far left) who happened to be running the game. I will be doing a full write up of that experience later. I would also lump the Starship Bridge Simulator into this category as it is something you book onto and play, and I will have more details on that in a future article. There are any number of shows that you can watch from things like Knightmare Live (yes, that Knightmare!) and the Dark Room. I attended Knightmare Live, the MMORPG Roleplaying Show and Syrinscape’s Live RPG Plus (pictured below). All of the shows I attended will get a full write up in the next couple of weeks. I didn’t attend the Dark Room, which some folk might consider heresy, as I ran out of time and am a man of limited means. I also didn’t get to go and see the Jollyboat Crew, which is a pity as so many folks raved about it and I met the lads who perform it when I was setting up my stuff in Knightmare Live and had a banter with them and they were lovely guys. John Robertson who does the Dark Room is also a lovely guy and you can read a review of his show last year that I did get to see HERE. I hope to see the Jollyboat Crew next year. There are halls upon halls for open games, where people can simply pitch up and play with their new purchases or even the stuff they brought with them. There were tournaments, awards and even a bit of cosplay. I have to say I didn’t see much of any of those as I found myself hurrying from one booking to the next via as many rest breaks as I could fit in, but they do deserve a mention. Overall this was a fantastic three days, which I have really only managed to scratch the surface of as there was so much going on. If you plan to attend in the future I would suggest Friday and Sunday are quieter days in the main hall. I would recommend the Starship Bridge Simulator to anyone. I would suggest planning your trip, regardless of how many days you go for. Find a show or an event or two to break up the walking, because as someone who has a physical disability, believe me it is physically demanding to get round. Speak to the stall holders and have fun. The UK Games Expo is made possible by an army of volunteers. Their job is physically demanding, and they aren’t getting to see the cool things whilst they are looking after us members of the public. To all the volunteers that worked this year, to all those who remembered me from my time in the trenches with them last year, and to those who noticed me when I was flagging and too stubborn to admit it, I say to you one massive thank you. It was great seeing you all whether I have met you before or not, you guys are amazing. 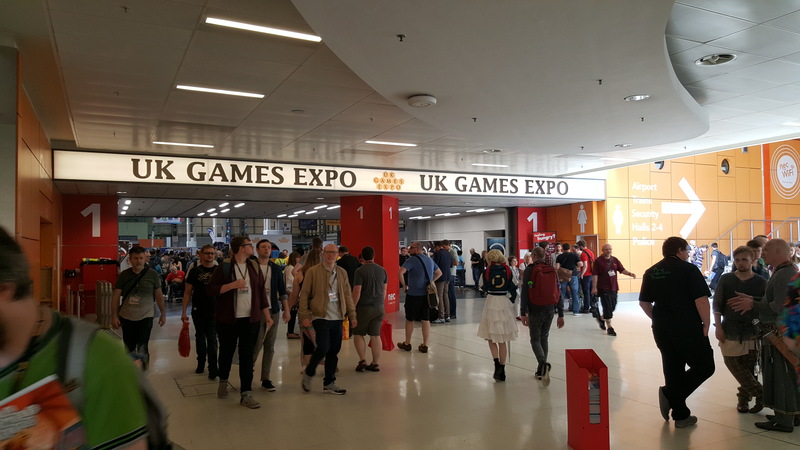 And that is my brief overview of the UK Games Expo 2018. Keep an eye out for future posts about all of the shows I attended and a couple of the games I play tested. All the best. Sounds like fun! They have a convention in Indiana every year called Gen Con and that seems like the American version of this one. I have never been, but it’s on my bucket list to go. Gen Con, yes, I think I have heard of that one but am currently restricting my cons to this side of the pond. That being said I hope it won’t always be that way and I’ll get to visit others. UKGE was a lot of fun, both the games there and the things to see and do. Visiting cons out of state or country is SO expensive, so I see why you don’t. Hoping to have it appear next thursday. Thanks for reading!